The holiday season, with its fun, food, travel, snow, marathon movie days, not to mention illness (cold chased by the flu), have played havoc with my writing schedule. It’s time to get motivated again and for that I usually turn to writing guides. I seldom read an entire guide. I usually skip to that parts that are relevant to my particular needs. Today, it’s motivation, so headed for the Kindle freebies to see if I could find anything short and to the point. I found several books that look promising. NaNoWriMo is awesome for motivation. While I wouldn’t want to do it every month, I wish it were more than once a year. I’m aware there are other extreme writing competitions and through the freebies today, I discovered a new (to me) one. The Story A Day challenge takes place in May. Participants must write one short story for each day of the month. During the rest of the year, the organizer, Julie Duffy, offers weekly writing prompts on her blog. She also wrote a book about breaking writer’s block, which is offered free today. Another freebie offers advice on how to write a book in 10 days or less. I’m usually skeptical of such claims, but the book has received a couple of good reviews, so I’ll give it a look. I’m always looking for advice on how to write faster and better. The final book has to do with unleashing the creative spirit. Sad fact, I know I’m the one who puts that leash around that neck. Time to break free! If you know of any books or websites that motivate and inspire, let me know! Writer’s block can come out of nowhere. It can be temporary and related to one project, or it can be chronic, stopping you from writing anything creative. It is always painfully frustrating. Julie Duffy, host of StoryADay.org, the month-long short story writing challenge, takes you through more than 60 techniques for breaking writer’s block that have helped StoryADay participants become insanely productive writers. 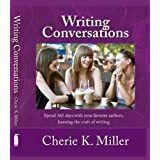 Conversational and light-hearted, this powerful guide may just become your favorite new writer’s handbook. You have always had some scenes and characters running through your mind; and now, you want to bring them all out of there and make the perfect story that people will love. So do you need to invest years of your life to fulfil this dream? Not necessarily! This ebook shows you how you can write your story in ten days… or less!